This site and the related web applications require cookies to maintain session state. Please enable cookies for this site. Thursday, Nov. 14th, is all about working with Xbase++. Although this day's presentations deal with subjects related to Xbase++ 1.9 as well as 2.0, the main focus is on working with tables/indexes and databases. The presentations dealing with SQL are designed for experienced ISAM/navigation-oriented developers looking to familiarize themselves with using SQL in their existing applications. The main goals here are to achieve better performance and readability of the source code. The second presentation on SQL illustrates how the technology may be utilized in alternative scenarios, that is, beyond just DBF tables and databases. More specifically, common programming tasks normally involving arrays or FOR/WHILE loops are being solved using Universal SQL, in a manner that is more elegant and even faster! Friday, Nov. 15th, the sessions mostly deal with web and mobile application development. But don't let yourself be fooled by the subject: the presentations X-HTML and X-DESK will change your view on how HTML and CSS apply to your applications! And that is because with Xbase++ 2.0, HTML/CSS-based content can be displayed independent of a web browser. This means that the visual appearance of an Xbase Part can be defined using HTML and CSS, allowing you to employ the same knowledge as for the design of your website - and vice versa! This opens up a whole lot of new possibilities, and provides you with functionlity going far beyond what is currently available with the owner-drawing feature. Saturday, Nov. 16th , is about providing you with vital information regarding the future of Xbase++, and about possible ways to make your development process more effective. More details about the conference, sessions and speakers can be found here. Of course, this is German language only - but a nice showcase for a dynamic website using the Xbase++ <CXP/> platform. With this fourth refresh of CTP3, we officially finish our work on the PostgreSQL ISAM-support in terms of featureset, reliability and performance. Upsize your existing dbf/ntx/cdx applications, add new features such as full-text search or use SQL statements for performing queries on the data upsized. This is what CTP3 is all about. The development team is already working on the first CTP4 drop, which we plan to release after the Southwest Xbase++ and FX Tracks 2013 conferences taking place in October and November. In order to download the Xbase++ 2.0 CTP3R4 build, please log into your customer account and go to Downloads->Community Previews. Of course, only customers with an active subscription and customers which have purchased Xbase++ in the last 12 months are eligible to participate in CTPs. 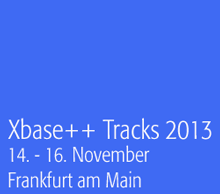 As already announced last year, the Xbase++ Tracks 2013 are going to be held from November 14th - 16th 2013 in Frankfurt, Germany. Three days packed with sessions will give you the opportunity to learn a lot about working with Xbase++. A detailed conference schedule will be made available during the next weeks. But so much in advance: each day will be dealing with a dedicated subject! Becoming more productive with Xbase++ - today and tomorrow! All sessions will be held in German only! We'd like to invite all non-German-speaking Xbase++ developers to join us at the Southwest Xbase++ Conference , taking place on October 17th to 20th, 2013 in Arizona, USA. Further details about the conference program and the registration process will be announced shortly. With more than 60 work items being resolved, this refresh has a clear focus on fixing known issues since CTP3R2. More details can be found in the Xbase++ 2.0 readme or the online documentation welcome page. In order to download the Xbase++ CTP3 build, please log into your customer account and go to Downloads->Community Previews. Of course, only customers with an active subscription and customers which have purchased Xbase++ in the last 12 months are eligible to participate in CTPs. The second refresh of Xbase++ 2.0 CTP3 has just gone online. The major changes of this community technology preview are related to Upsizing of dbf/ntx/cdx-based Xbase++ applications to the PostgreSQL server, and the usability and reliability of the Xbase++ Workbench. In fact, 442 work items have been resolved since CTP3R1. Specifically, the visual debug feature of the Xbase++ Workbench has been increased dramatically in performance and usability. In addition, we did a major rework of the way Xbase++ manages projects. Multi-target and multi-directory projects are now handled much more efficiently, which is crucial for any larger Xbase++ project. We would like to encourage all CTP participants to have a look into the readme prior to installing the CTP! The file contains a lot of important information, especially concerning side-by-side installation of this CTP with an existing 1.9SL1 installation. Alaska Software announces registration opening for the second Southwest Xbase++ conference taking place in Arizona, USA, on October 17th 2013. Wether you are looking to increase your productivity with Xbase++ or just want to learn about getting the most out of the exciting new features in Xbase++ 2.0: Southwest Xbase++ is the place to be! The track and session details can be found here. All registrations made until June 30th, are entitled to receiving a super-saver discount of USD 125! With Xbase++ 2.0 being available at the time of the conference, naturally a good part of Southwest Xbase++ is dedicated to advancing your programming skills by covering fundamentals, how-to's and best practices related to the new features, concepts and technologies introduced in that version. Just check out the session list in the Solidifying Xbase++ track! However, it goes without saying that other hot topics such as web development using HTML and CSS also feature at this year's conference. But don't wait too long to get yourself registered. Last year's conference was overbooked so a number of attendees were unable to get a room at the conference hotel! Better secure your room sooner than later and send in your registration today. You'll also make yourself eligible for receiving the super-saver discount which comes with a free half-day pre-conference session! More information and the registration form is available here . Still not sure whether you should attend? Still got any questions? Drop us an email ! Announcements and latest news about the conference are posted on Twitter. Follow us @swxbase . In accordance with our Product Maintenance Policy a series of Hotfix Rollups for Xbase++ 1.90 SL1 just has gone online. The Hotfix Rollups #46 - #50 cover various issues related to Windows 8 and the Advantage Database Server 11.1. As always, we would like to remind our customers to download and apply Hotfix Rollups only in the event they are observing one of the issues as outlined in the related PDR description. More details about each Hotfix Rollup including download information can be found under Login-> MyAccount-> Downloads-> Hotfix Rollups or here . Alaska Software announces today the public call for speakers for the forthcoming Southwest Xbase++ Conference to be held on October 17th - 20th, 2013 in Gilbert, Arizona, USA. How to become a speaker at Southwest Xbase++ 2013? First, read the call for speakers document here. You can submit your session proposals online at the session submission site . Proposals must be handed in no later than March 29th, 2013! If you have questions or doubts regarding your session proposal, feel free to send an email and discuss your issues with us. Speaker selection will be completed on April 12th. The session material is due on 23rd September, 2013. Speakers receive an all-inclusive package, meaning travel, hotel and conference ticket are free! To learn more about your opportunities at the Southwest Xbase++ 2013, please read carefully through the call for speakers paper.